Disclosure. It’s happening now. This phase will reach a peak at which it can only explode in all directions in the mainstream media. SCROLL DOWN FOR RECENT RECORDINGS. Russia is not part of the great Conspiracy of darkness of the Elite. The Russians have fought their wars of freedom and overcome the demons of their anterior political system. It is not that everything is perfect in President Putin’s government, but there is no self serving agenda representing an obstacle to the manifestation of the Divine Will on Earth, as there is in the Western countries. This is because Russia has already been led and influenced by a Galactic Walk-In for a few years. This Walk-In is conscious of his connection with Ashtar Command. I am permitted to make this revelation. One country never was better than the other one in the so-called Cold War. Understand that the War has always been one of the Dark attacking the Light in the sons and daughters of God called lightbearers, lightworkers, or boots on the ground, or Star seeds, in every nation. The Secret occult government of the world is the one that pulls the strings of the Illuminati Elite and of the elected governments. The deluded members of the Elite and Military have entered into an Alliance with negative entities to obtain superior technology in the era of World War II and as a result have been in possession of undisclosed sophisticated technology for many decades but have not disclosed this fact, nor shared its possible benefits with mankind because they had an Agenda of global control. Although the spiritual Hierarchy together with its Galactic fleets have recently regained control of the Earth and the Solar System, and negative aliens have been removed for the most part, the Elite and its military arm, the Cabal, have maintained one foot in one country, and the other in the enemy they have created to carry out terrorist deeds. That is the reality of the situation if you want the big picture. The Illuminati is occult and Satanist. They have taken decades to implement their strategies of darkness. They have master-minded a plan involving political manoeuvres to cause chaos in the Middle-East as well as Western countries, as part of their agenda of control, and we, the spiritual gardians and mentors of mankind, are letting them do this because this situation has to unfold so that the people awaken, react to atrocities, and take a stand to obtain change. The clear-up that has to be achieved must be carried out by the incarnated ones who have freewill to do so. This cannot be done by your Galactic cousins or Star kin, for instance, because of the law of non-interference. This is the time of the Harvest when souls are choosing whether they want to walk the path of Righteousness or not. If they chose the left one, it will keep them in the world of duality and a 3rd dimensional Reality. The way you perceive what is happening in the world due to the way world events are presented in the Media, may make you feel that the global situation is worsening. It may be what the occult Elite wants you to believe as they still control most of the media. Beware the propaganda that is designed for control and to cause fears. The angle presented in Alcyon Pleiades’ videos is reliable. Be aware that there is no Global Warming crisis. It has been disclosed that they want to prevent the Third World from becoming prosperous and that Africa is three times larger than it is represented on the national maps. The scientific dissemination of knowledge is inaccurate from Darwin’s theory of evolution to Genetics and Physics. It has been exposed, that the conspiracies have plans for policies that would be lucrative, so follow the money. However, they have spent trillions of dollars on chemical trails and geo-engineering for purposes that have not been fully exposed, and that are not related to Global Warming. Political Analysts have said that I S I L or ISIS is the product of a Western conspiracy and received funding from the West, although it is much more complicated than that. HOWEVER, a development into a Third World War can’t be allowed and most nuclear weapons have been deactivated, or actually taken away. Yes, as in ‘beamed up’! There is a spin in this timeline that the occult powers may not be expecting, or are dismissing: it’s Disclosure. They are surprised that it is happening and is out of their control. They are presently being exposed for what they are and are doing. It’s happening now. This phase will reach a peak at which it can only explode in all directions in the mainstream media. Some people in position of authority can still open their eyes and realize that this Agenda of the Elite force is self-serving and destructive for the world. The subject of the suppression of Truth in regards to the Extraterrestrial presence, is the explosive that will set Disclosure in motion towards an understanding of what has really been going on. It will eventually set it all in the context of Galactic History, its alien take-over as well as the world’s liberation by the intervention of our Galactic families, as well as the Spiritual Hierarchy of the Solar System. The next step in man kind’s re-education will be on the subject of the existence of higher dimensions, although the ideas are already present in Science and science fiction. A connection will be made between them and the Heaven of religious scriptures. People will discover that the human family’s DNA has been manipulated by geneticists many thousands of years ago. So the fact that people should not even have to die after such a short lifespan, never mind get afflicted by diseases, will represent a great new hope. The fact that the Solar System is moving through a part of the Galaxy in which Photonic Light is very intense, and causing an Awakening, leading to a recovery of full consciousness in people, will be understood, and this will begin to happen within a few months and will expand. A change is on the horizon of Destiny. We are about to enter a phase of Transition, as you know. The worst among the recalcitrant ones will eventually be taken away, though Gaia loves them as she loves all her children, and is reluctant to give up. She is however on the verge of having to let them go, for the freedom of the many must be restored. The Lightworkers already are experiencing more than fleeting moments upon the lower levels of the 5th Dimension in their consciousness. Some are firmly established upon it, but for the most part mankind is passing through the 4th Dimension. It is not by coincidence that it is at this time that they are experiencing the effects of the Elite’s desperate attempts to increase their tyrannical control of the world, by all manners of political moves. They have funds for doing so as they own the financial Institutions. They want to play a few more cards. They may attempt to claim that the Galactics are a threat when their suppression of truths is exposed concerning the Extraterrestrial presence. They have holographic technology at their disposition and could use it to present a false scenario of invasion. However, Disclosure will uplift mankind upon the ladder of the dimensions and frequency vibration, because information is Light and vice versa. So you see, that is why Disclosure plays a major part in the Ascension process. The Aurora Borealis are now visible in parts of the world where they were not before, because of electromagnetic changes taking place due to the irradiation of the planet by photonic light. As regard to the threat of Robotic Control, the question of transhumanism and whether the occult satanic powers will attempt to steal the human DNA for supreme power, do not forget that billions of Star seeds and Galactic beings, as well as Ascended Masters, now have incarnated in human bodies. They are holding the balance of Light and will render these evil forces powerless by transforming all systems. The Elite is in fact fearfull of them though they possess sophisticated undisclosed technology. Their malevolent tactics will lead them nowhere. They already have robots that look perfectly human but understand that the forces of the Light are very active and actively opposing these malevolent forces in the measure permitted by Cosmic Law. It is the way that they operate in the higher dimensions. Whether biotechnology could be applied to medical use and whether the occult rulers plan a scenario similar to the one in the movie The Terminator, the answer is that as with the matter of alien implants, nanotechnology will not pass when people physically move into the higher or even middle levels of the 5th Dimension. The killer robot was unleashed from Pandora Box on Maldek, and artificial intelligence is as dangerous as nuclear power or weaponry. As to the zealots who will blow themselves up because of their fanatical nature, they are lured into self-annihilation by the false hierarchies of the astral plane, sometimes called the bottomless pit. There is a record of the original Fall of certain entities called Nephilim, or Fallen Angels, whose rebellion against the Almighty was driven by jealousy. It’s in relation to the Reptilian humanoids. Their rebellion constituted a spiritual suicide. They acquired densities within them as well as self-destructive tendencies. Whether on the astral plane as discarnate entities, or in incarnation, the Illuminati have attempted to draw humanity into their Cult of Death and Hell for revenge against Life itself and in order to continue exercising control. The denizens of the pit have preyed upon the Lightbearers with thoughtforms and psychotronic weapons computerized by those who originate from Orion and Draco that affect the psyche. You may call for the cutting free of mankind from the momentum of suicide, because those recruits of the Terrorist organizations, who are prepared to detonate bombs that they are wearing in the midst of innocent citizens, are under the influence of vortices of malintent. There also was an Illuminati opposition to the Constitution, the divine document that was born out of the heart of Saint Germain. It was his dream that America would be an example for all nations but an infiltration of dark forces prevented this from happening. In defiance the dark caused internal weaknesses so Justice and Freedom have not triumphed in recent decades. You may call the Elohim to overlight every aspect of the Running for Office, at this time of the coming Elections in the United States of America. Pray that the Council on Foreign Relations and Agencies, as well as Pentagon and CIA, may be turned upside down and shaken up, until beings of the Light are in position of authority, for it is the time when they awaken and have a change of heart, or Walk-In advanced souls move into position. Pray that the elected ones can never pass legislature for programs that are not of the Light. Demand changes to manifest by the intervention of the Mighty Blue Eagle from Sirius and the Legions of Mercury of El Morya. Demand the removal, by the action of the Cosmic Christ, as well as Archangel Michael’s Legions of the First Ray and Elohim Astrea, of the individuals in the governments of all nations who are not serving the Light. The Sacred Fire and Violet Transmuting Flame can also be invoked. Demand the manifestation of the Plan of Abundant Supply. The blueprint of divine Destiny will manifest with the descent of the Light Body, as you become heart, head and hand of your Higher Selves. This multi-dimensional assistance can be tripled each instant of each hour, until all are ascended and free in that quantum leap to a 5th dimensional Reality. I now ask that you may all be enfolded in a gigantic pillar of pure dazzling White Light so that you magnetize to you the destiny of America so desired by Saint Germain, as well as the global peace so desired by Jesus the Christ, Archangel Michael, the Universal Mother and all of heaven, as well as the lightworkers. May the great Prophecy for the Earth that is the manifestation of Divine Will be fulfilled now! Be sealed in the immaculate design of the timelines leading to Ascension. Awaken in the knowledge of the all-consuming love which never fails to give Earth her Freedom now! Let the Truth be revealed in this time of DISCLOSURE. There is such a thing as the authority of Mother Mary and the release of Cosmic forces in the Great Central Son. Mother Mary embodies the presence of the Mother Universal and the Cosmic Virgin who commands the full force of the Sun behind the sun. The Cosmic Virgin rescues the Universal Manchild so he appears in the hearts of the sons and daughters of God. You may invoke her power to devour the power of the occult tyrannic false hierarchies. The armies of darkness will crumble! They wil tremble in the cup of their harvest in the physical octave in a way never seen before. The Mother will step through the veil in the flesh of her children. Therefore affirm: I AM Mother Mary, heart, head and hand. I ask for the consecration of every nation to the heart of Mary. Our burdens can be set aside by her intercessions. That is why we say ‘Hail Mary, full of grace!’ and ask that she prays for us, the Lightworkers. Let all receive the awakening presence of the divine Manchild, higher consciousness. Let the Twin Pillars of the Twin Flames manifest in the Solar Ring that is the platform for the Tube of Light, our tool and pathway to the manifestation of New Gaia, as well as Ascension. The Flame of Living Truth will transmute all erroneous concepts and feelings. It will set free. It will manifest the science of precipitation whereby one can bring into form one’s perfect health, happiness, and divine plan for one’s families and communities. This can be manifested as part of the Vision that Saint Germain, El Morya and the Darjeeling Council hold for the world to recreate a civilization that is abundant for a time of Transition. 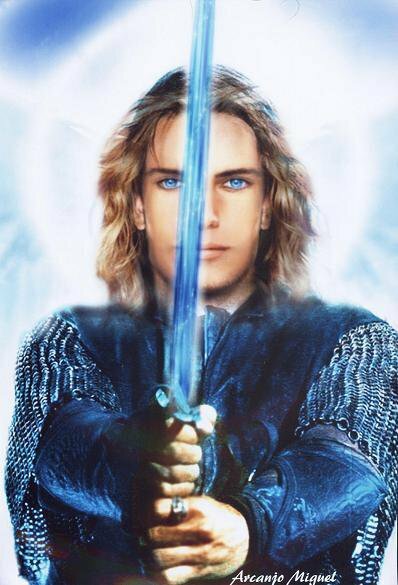 With love and blessings to all, I represent Archangel Michael saying ‘I AM WITH YOU ALWAYS’.